I'm not a big vampire fan. I've only read a handful of books that featured them and only really like a few of the Christopher Lee and Bela Lugosi movies but not much else. Next to zombies they are undoubtedly the most over-hyped and over-used type of creature in all of horror. I get the attraction, I suppose. They have sharp and pointy teeth and weird accents and a sense of tragic melancholy about their tortured immortality and so on and so forth. It's not scary to me, but I guess folks find them romantic or something like that. I personally think they're boring. However, vampires can be awesome if you take buckets full of blood, a half-baked story line, and a willingness to not take the whole vampire shtick so seriously and mix all that up into one pretty cool anime. Hellsing as a show is sort of an incoherent mess, but it has enough moments to make the show pretty memorable. The show kind of reminds me of those Chuck Norris or Sylvester Stallone movies in which the movies themselves are sort of crummy, but we are just watching because of the actors and that somehow makes the movies better. Of course, that feels like I'm selling the show a bit short to say that, but there really isn't a better or nicer way to say it. There are much better shows out there to watch in terms of story, but if you an want an over the top bloodfest and you've already seen Elfen Lied and When They Cry then you could do worse than to watch Hellsing. There's enough blood and foul language in this short thirteen episode show to make a Tarantino movie jealous. People are getting ripped in half and torn to shreds at multiple points during each episode. This show treats blood as a selling point and really brings it. Along the way we more or less get introduced to the plot and primary characters. 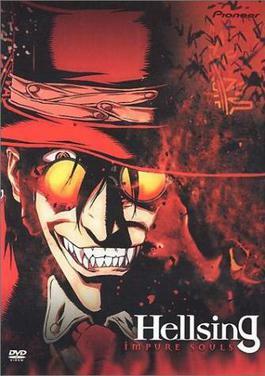 The show is essentially about a vampire named Alucard (I know it's unoriginal, but this show isn't exactly aspiring to achieving television greatness) and for some strange reason Alucard is serving the Hellsing Organization, an organization hellbent on protecting the British Empire from undead ghouls and Satanic freaks. Along with Alucard, the police girl Seras Victoria serves as the Hellsing Organization's other resident vampire after accepting the gift of "dark salvation" by the teeth of Alucard. Together, the two vampires and the Hellsing Organization try to weed out just who is creating the strange "freaks" that are trying to demolish the Hellsing Organization and the British Empire. This show is a very quick watch because it is so short, but it doesn't really have an ending. Of course, one could argue that there really isn't even much of a story, but I suppose that's all in the eye of the beholder. About six of the thirteen episodes of this show are not based on the manga because, at the time this show was being made, the source manga had not been completed so the creators of the show basically improvised the second half. Sometimes this works and sometimes it doesn't. With Trigun and Claymore it definitely worked. I'm not really sure if this show worked or not. More recently, a multi-part OVA was made entitled Hellsing Ultimate and I am very interested in seeing that show and just how it is different. This newer show is said to follow the manga so the show should be interesting just what the original ending of the show was supposed to be. I hear there's even neo-Nazis in the new show. Damn, vampires and neo-Nazis... where the hell do I sign up? I just pray this time the story is a bit more coherent and the animation is a little bit better. I personally found Hellsing's style to be a bit "blocky" and the characters didn't really come alive to me. Again, there is a lot of foul language and violence and the story is a mess, but the show is worth it, I think.